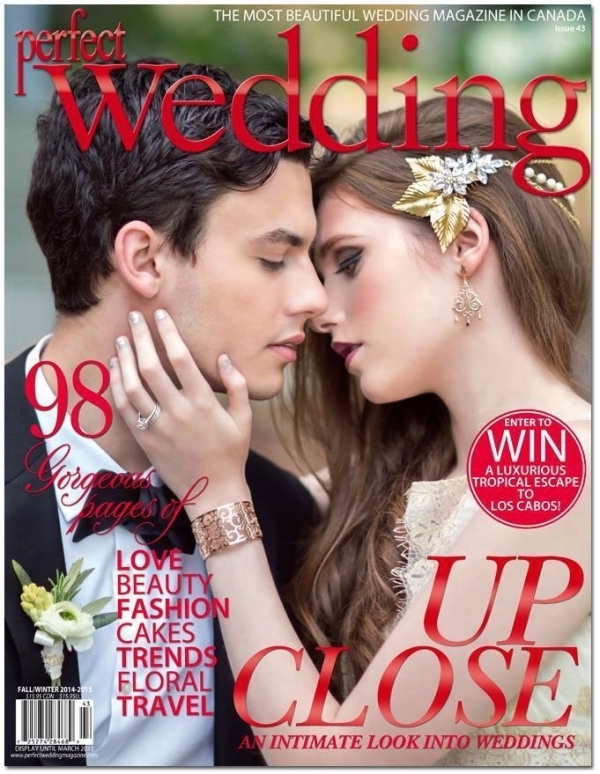 Perfect Wedding Magazine…We made COVER!!! At the end of the day, we are all tired…we kick back and pour ourselves a glass of wine and try to unwind and let the day slip away. Well, on a particular night earlier this Spring, Kim Maru and I did the opposite. With both of us so busy, like everyone else, the days seem hard to connect…but we’ve worked together before on collaborative projects, and we had a new idea brewing. It was honestly very late, and how this shoot came about was a last point we covered in conversation and just decided to make happen…Our New Year’s Eve themed shoot was born! Immediately Pinterest boards were brewing, and reaching out to our Dream Team to have them on board again was done immediately! Having worked with them on another project the previous Winter and the exposure we got on blogs was more than we expected. We got coverage here in BC, and in the US. So doing this project without these amazing professionals…well it just wouldn’t be possible. They are the best, and we all mesh so well. Honestly … working with these professionals on location at Hycroft Manor was nothing short of a fun day with friends…that’s really what it felt like. We all brought professionalism and our talent, we worked hard, but there was also so much laughter, and goofing around…we had genuine fun, and you could tell we all love what we d0! It’s been a long time since we did this project back in May, and to find out that not only is our work being featured on the inside, but that we made COVER, well you can imagine how all of us feel. A huge accomplishment for each of us, and I am humbled. I am so proud of all of us, and for me personally this is huge. To pick up the Magazine and touch the pages that feature your work, well it’s surreal. It’s something I always strived for and wished for when I first started my business, just over 2 yrs ago. I share this with my Partner Kim, and our amazing Team, and I send the biggest Thank You to Editors in Chief Gordon Cooper & Claudia Torres of Perfect Wedding Magazine! Just incase you were wondering if I celebrated tonight, yes, I did! I went out and got a very nice bottle of wine, and savoured in the moment! I can’t wait till all of us girls get together next month to celebrate this huge accomplishment! Make sure you visit these vendors sites, and find out a little more on who they are…they are worth working with and are Professionals! If you are looking for assistance with your Wedding, contact these individuals, you’ll be glad you did! Get your hands on a copy today and see how our New Year’s Eve themed idea turned into an “Attraction in Gold” of Elegance, Glam, Class and lots and lots of decadence and Champagne Bubbles!! Check out our Behind the Scenes Film on how our Cover Shoot came to be, and photos from our Magazine Feature!